Come and explore the underwater world. We have entrusted your scuba experience to a 5* PADI diving school who will take you through every step in the warm, clear waters of kalithea. You don’t need to have any previous experience (although experienced and qualified divers are welcome) and you just need to bring your bathing suit and a sense of adventure. Your first dive will be an unforgettable experience, but just in case you will also get a photograph! Before and after your dive you can swim from the boat or the shore and use the snorkeling equipment. Additional fee for snacks and drinks on board boat . Passengers not diving or snorkelling can enjoy a lazy day boat trip. Absolute beginners minimum age 8 years. Extras available on Board: Possibly Second Dives 28.00 € Photo CD 15 € DVD 20 € . 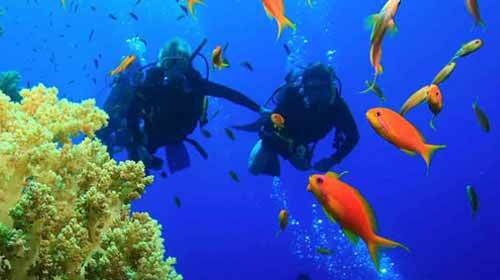 Scuba is also available for the South of Island for Lindos and Pefkos. Contact us for info and prices.